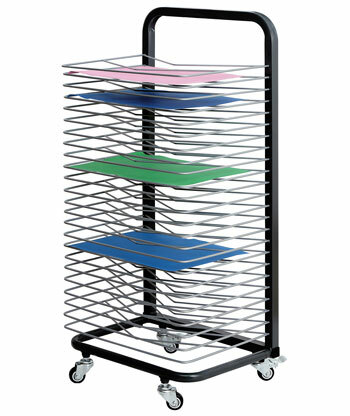 Strong robust steel frame trolley, designed for longevity and to manage the daily rigours of a busy school environment. 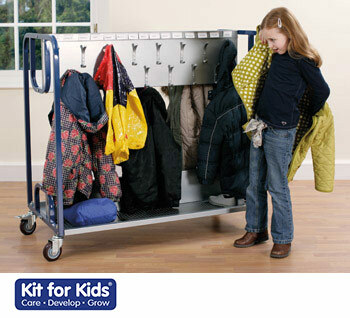  A manoeuvrable trolley with a large base storage shelf, ideal for shoes and bags with a centre divide.  15 double coat/bag hooks each side to store 30 coats.  Engineered for function and ease of mobility with large heavy duty castors (2 lockable).  Attractive and ergonomic, meets BS5873 safety tests for strength, stability and safety. 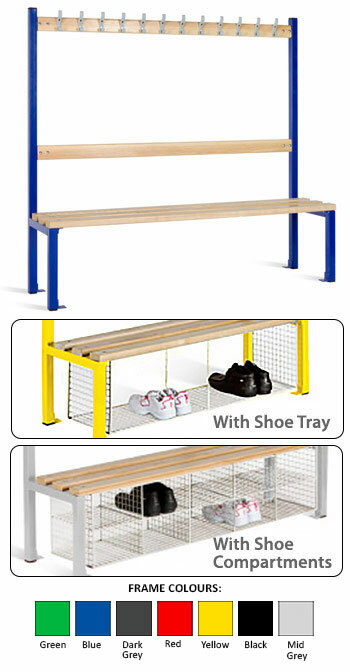  Reinforced blue and silver powder coated (EPC) scratch resistant structure gives superior strength. 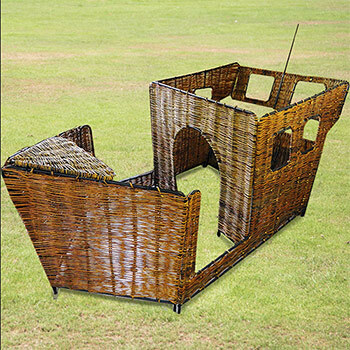  Supplied flat packed for fast easy construction. Premium heavy duty and robust trolleys, designed for longevity and to manage the daily rigours of a busy school environment.  15 double coat/bag hooks each side to store coats.  Metal label holder on the end panel to identify class or year classification.  Contoured MDF beech laminate panels with sealed matching edges for added durability, wipe clean and low maintenance. 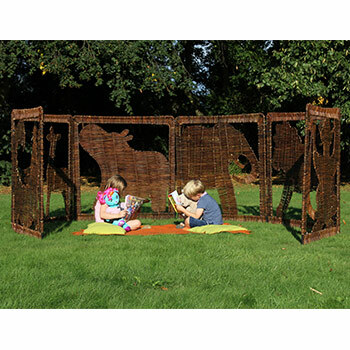  Reinforced powder coated (EPC) scratch resistant tubular frame structure gives superior strength.  Heavy duty castors for easy mobility around the school (2 lockable).  Attractive and functional ergonomic design for stability, strength and safety.  Meets BS5873 safety tests for strength, stability and safety.  Manufactured from Japanese Ash MFC and fully welded steel. 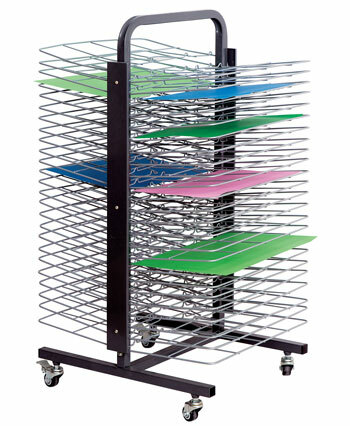  Top units supplied with back support bars that can adjust the height of the top unit. 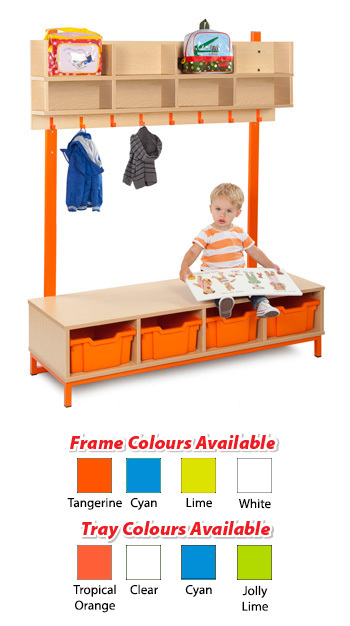  Frame colours available in Tangerine, Cyan, Lime and White. 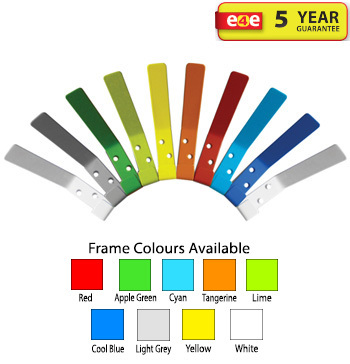  Frame colours available in Lime, Cyan, Tangerine and White. 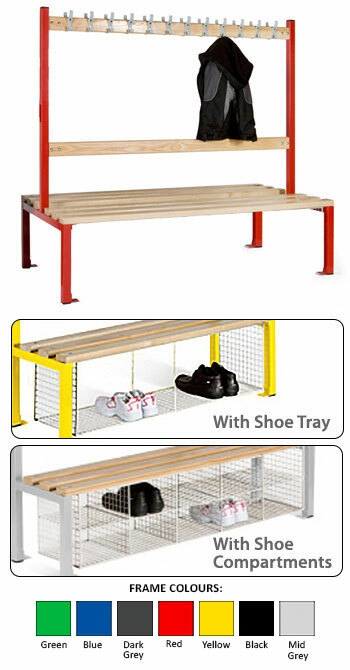 Features ash wood slats, anti-bacterial powder coated paint finish. Also available are mesh shoe container attachments, with either one large tray or individual compartments. Supplied flat-packed. On-site assembly required. Please allow approx. 7-10 days for delivery.  Keep role play clothes tidy with this plastic coated compact mobile cloakroom. 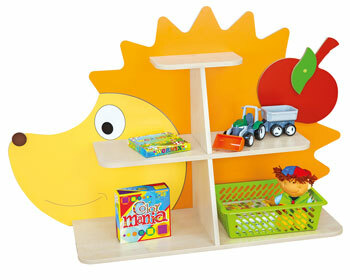  The unit has a storage area for shoes and 10 double sided hooks. Dimensions: W460 x H1130 x D750mm. 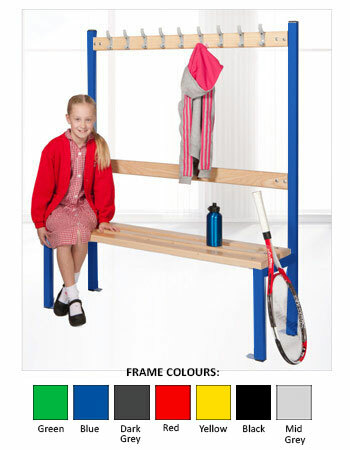 The corner L bench is ideal for seating children comfortably whilst fiting neatly into the corner of the classroom or hall. 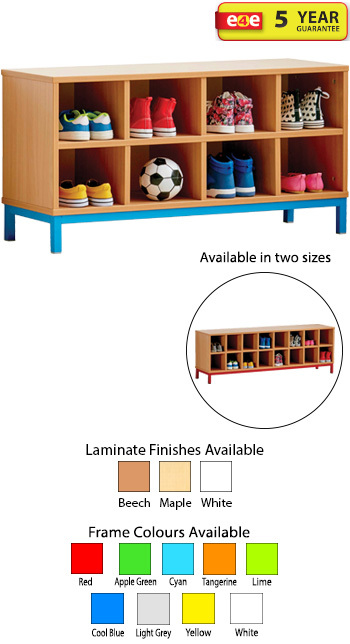 15mm covered MDF shoe-storage unit with bullnosed polished edges. Plain MDF dividers. Supplied with 10 clear plastic trays for tidy shoe storage. 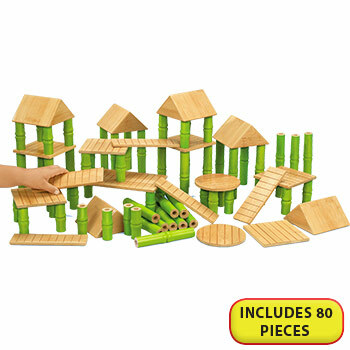 Supplied in flat-pack form with easy to follow instructions. 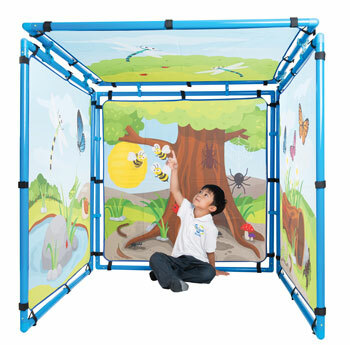 High quality coloured hooks with their own "pocket" for a photograph or character image recognisable to the children. Mounted on a solid beech rail. The two nameplates need to be attached to a wall (fittings not provided as type of fitting required depends on the wall). There are 10 hooks on these items. Dimensions (LxWxD): 1200 x 190 x 50mm. 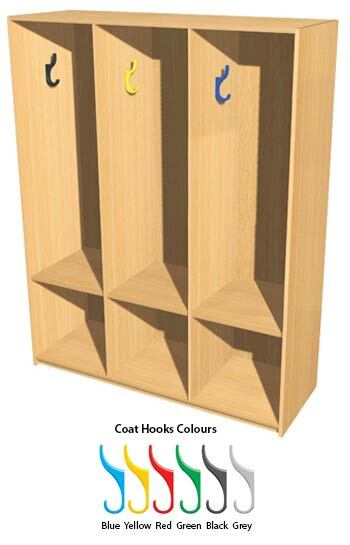 Double sided beech dressing up/cloakroom unit featuring 20 coat hooks with "pockets" for identification tags. Both sides feature a seating area with ample storage space underneath, capable of holding 3 trays or baskets (not supplied with the unit). 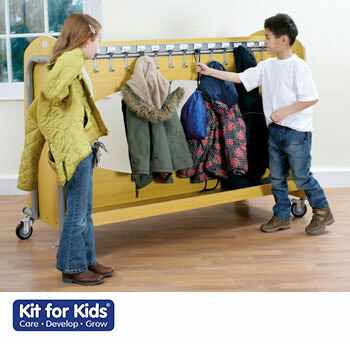 These units could be used for imaginative dressing up play or more formally as a coat rail in the reception areas. 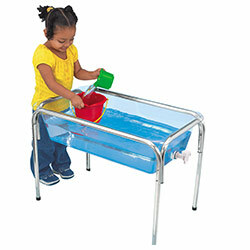 The units are fitted with castors so they can easily be moved around as required. Dimensions (HxWxD): 1095 x 1230 x 600mm.  These Premium Coathooks consist of 9 widths, ranging from 400mm all the way up to 2000mm. 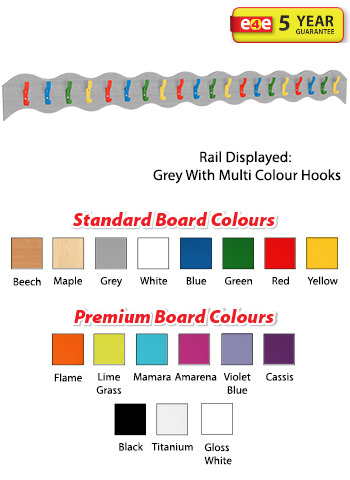  Includes indestructible coat pegs available in a choice of nine colours: red, yellow, purple, orange, fern green, navy blue, sky blue, mid grey or black.  Board manufactured from 18mm MDF.  Board available in five wood finishes: beech, maple, oaks, grey and white. 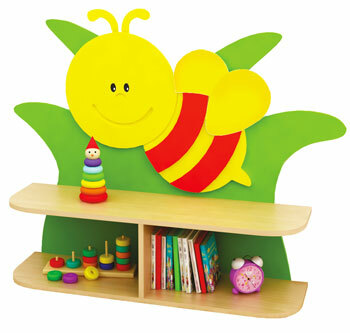  This colourful wavy coat hook rail is highly ideal for younger years and will brighten any cloakroom.  Supplied with 10 multicolour hooks.  The base is available in a vibrant range of colours. Standard colours are included in the price and a range of Premium colours at an additional charge.  Features powder coated aluminium hooks.  Supplied with 15 multicolour hooks.  Supplied with 20 multicolour hooks. 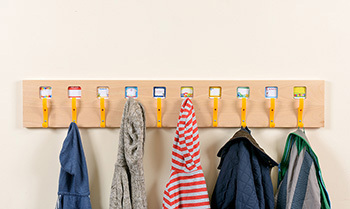 The KubbyClass mounted coat hooks range consist of 11 lengths (widths), ranging from 600mm all the way up to 1600mm. 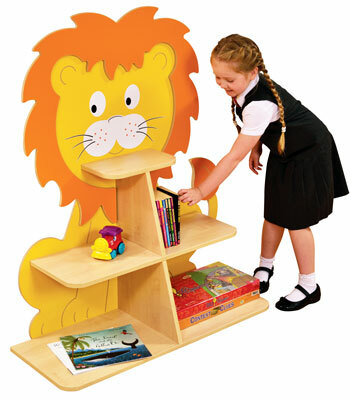 Manufactured in a 18mm MDF maple laminate with a 2mm bump resistant ply-effect edging. 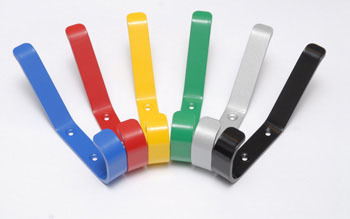 Featuring unbreakable hooks that are available in 9 different colours. Not only are these hooks super tough, they have been designed with saftey in mind. Others use aluminium coat pegs, that when they break they can leave a dangerous sharp edge behind. Theme (panel) Colours: Lime, Red, Lilac, Plum, Jaffa, Blue, Powder Blue - Maple & Beech also available. 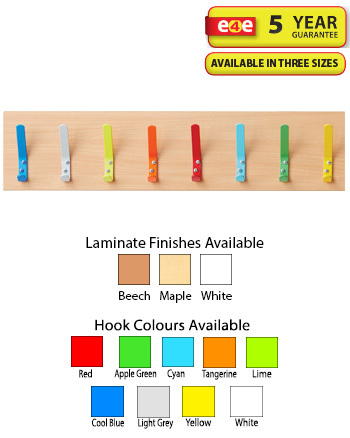 Just choose your width, theme and coat hook colours below. 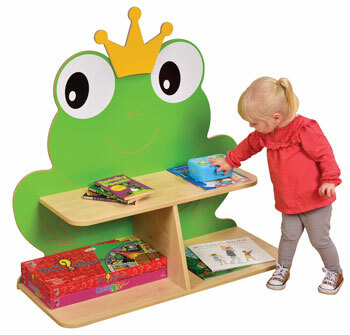 Manufactured in a 18mm MDF maple laminate with a 2mm bump resistant ply-effect edging. Featuring unbreakable hooks. Coat hooks mounted on a beech finish rail manufactured from melamine faced MDF with a lacquered bull-nosed edge. 1500mm rail comes with 15 hooks . Available in blue, red, yellow, green, grey, black or mixed. 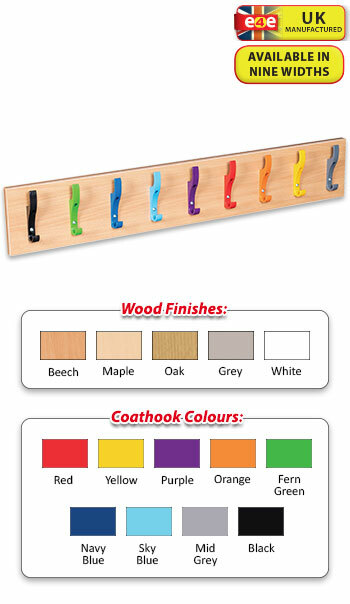  Colourful coat hooks mounted on a board suitable for any junior setting cloakrooms.  Hooks can be supplied multicoloured or one solid colour.  Available with 3 hook quantity options: 8 hooks, 16 hooks or 20 hooks.  Available on beech, maple or white MDF. 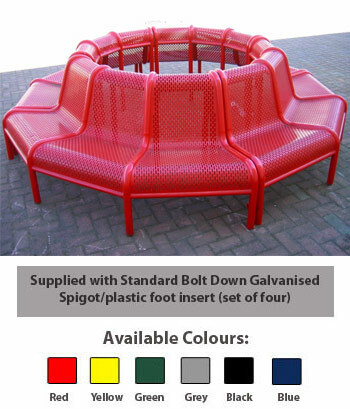  Can be supplied multicoloured or one solid colour: available in red, apple green, cyan, tangerine, lime, cool blue, light grey, yellow or white.  Dimensions of 8 Hook Top: (HxW) 180 x 1200mm.  Dimensions of 16 Hook Top: (HxW) 180 x 1500mm.  Dimensions of 20 Hook Top: (HxW) 180 x 2000mm. 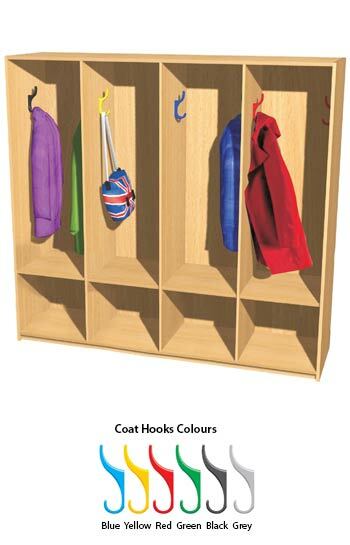  A pack of 10 vibrant coloured cloakroom hooks.  Available in red, apple green, cyan, tangerine, lime, cool blue, light grey, yellow or white. 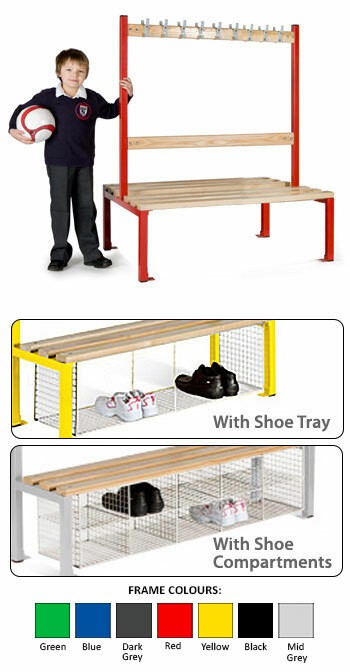  An open compartment bench highly suitable for footwear storage.  Available with a choice of 8 open compartments or 16 open compartments.  Available in beech, maple or white MDF. 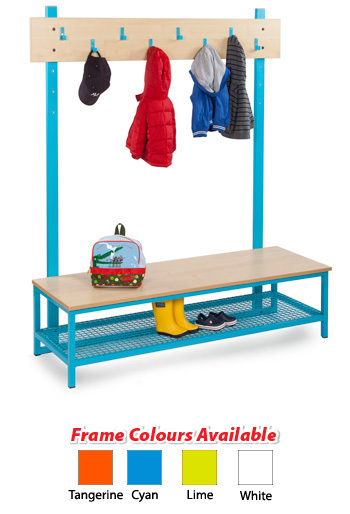  Open compartment is fixed to a fully welded steel metal frame available in a variety of colours: red, apple green, cyan, tangerine, lime, cool blue, light grey, yellow or white.  Dimensions of 8 compartment bench: (HxWxD) 515 x 1200 x 350mm.  Dimensions of 16 compartment bench: (HxWxD) 515 x 1500 x 350mm. 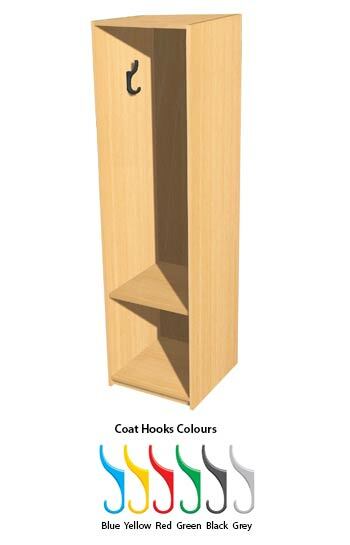  This fully assembled cloakroom station is solidly constructed in a durable, scratch resistant, wipe clean laminate. 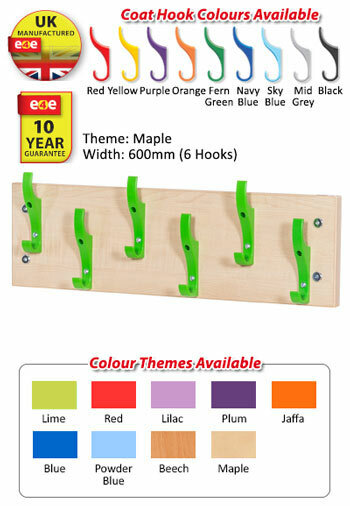  Includes 8 indestructible coat pegs available in a choice of nine colours.  Available in five wood finishes: beech, maple, oak, grey or white. 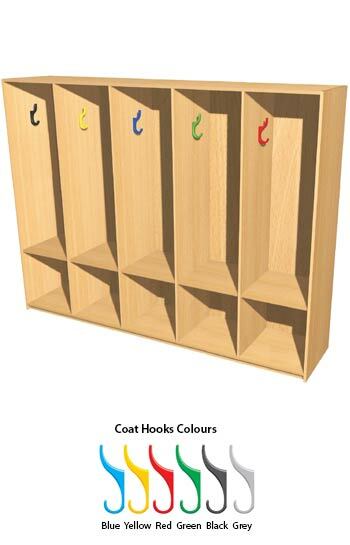  Coat pegs available in nine colours: red, yellow, purple, orange, fern green, navy blue, sky blue, mid grey or black. 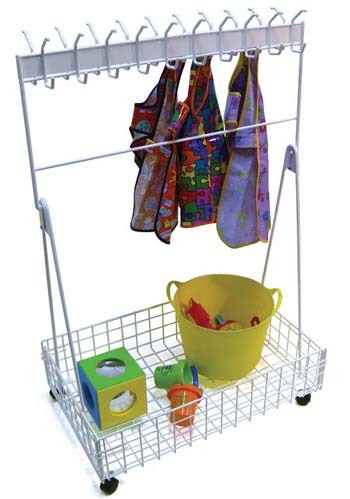  This fully assembled double sided cloakroom trolley is solidly constructed in a durable, scratch resistant, wipe clean laminate. 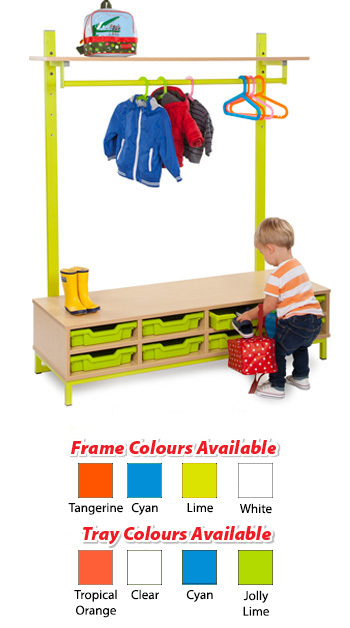  Includes 16 indestructible coat pegs available in a choice of nine colours. Manufactured from melamine faced MDF. Single bay open cloakroom station. 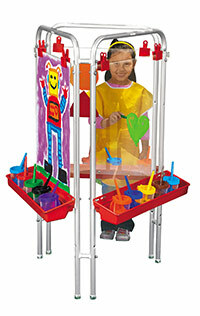 Includes 2 unbreakable coat hooks and shoe storage. Fully assembled open cloakroom station are solidly constructed in a durable, scratch resistant, wipe clean laminate. Blue, Yellow, Red, Green, Black, Grey or Multi-coloured. Manufactured from melamine faced MDF. Double bay open cloakroom station. 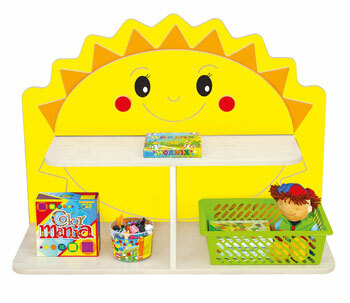 Includes 4 unbreakable coat hooks and shoe storage. Manufactured from melamine faced MDF. Triple bay open cloakroom station. 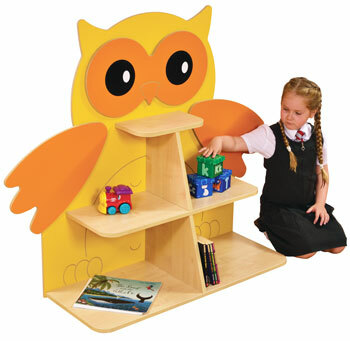 Includes 6 unbreakable coat hooks and shoe storage. Manufactured from melamine faced MDF. Quad bay open cloakroom station. 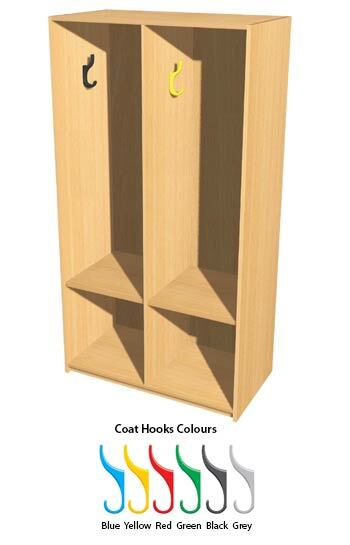 Includes 8 unbreakable coat hooks and shoe storage. Manufactured from melamine faced MDF. Quint bay open cloakroom station. 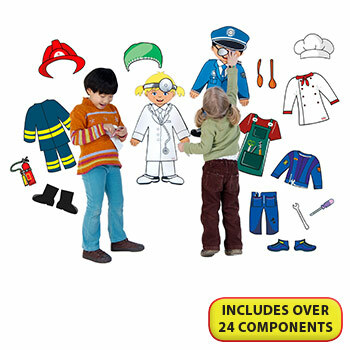 Includes 10 unbreakable coat hooks and shoe storage.